The Early Bird Catches the LV bag: The earlier you get there, the better stuff you'll find and the less people you'll have to push and shove through. Cash is King: Trust me, this will just make your experience much easier. You'll need cash to get into the flea market and some vendors don't take plastic. The last thing you'll want to do when that hipster girl is eyeing your vintage dress is make an emergency run to the ATM because the vendor won't hold it for you. Zinc: In the words of Baz Luhrmann..."wear sunscreen". We're rounding into summer so consider either bringing the SPF, wearing a fashionable, yet protective hat, or showcasing that parasol you got a Coachella two years back. Barganing 101: If the vendor gives you a price for an item and you thought it was going to be more...i say just pay for it. However, if you get there and the amount seems a little steep, feel free to ask if they'll take a lower amount. 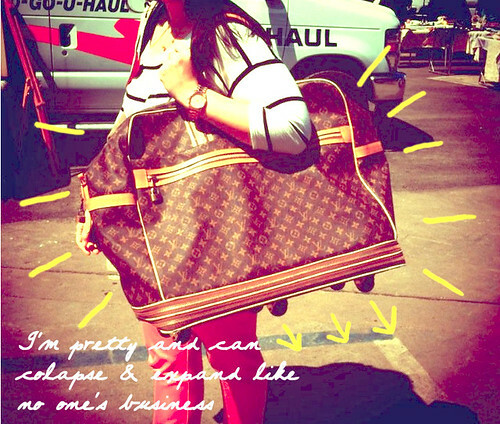 We were able to knock down our Louis Vuitton travel bag an extra 15 dollars. That's enough to buy one meal in Los Angeles! oh yeah, and bring comfortable shoes. Hey Chantal! We ended up paying around 180 for it. When it expands, it's big enough for a person to get in. Mmm mmm MMm that is one good looking bag.